Fresh off a 45-28 victory at Idaho, Ohio (1-0, 0-0 MAC) will hope for a better result than the last time they faced the Herd. A year ago in Huntington, the Bobcats were all but run out of the “The Joan” by Rakeem Cato and Co., and traveled the 90 minutes back to Athens with a 44-14 defeat. Cato graduated along with some of his weapons, but don’t think for a second that this will be a down year for Marshall’s program. 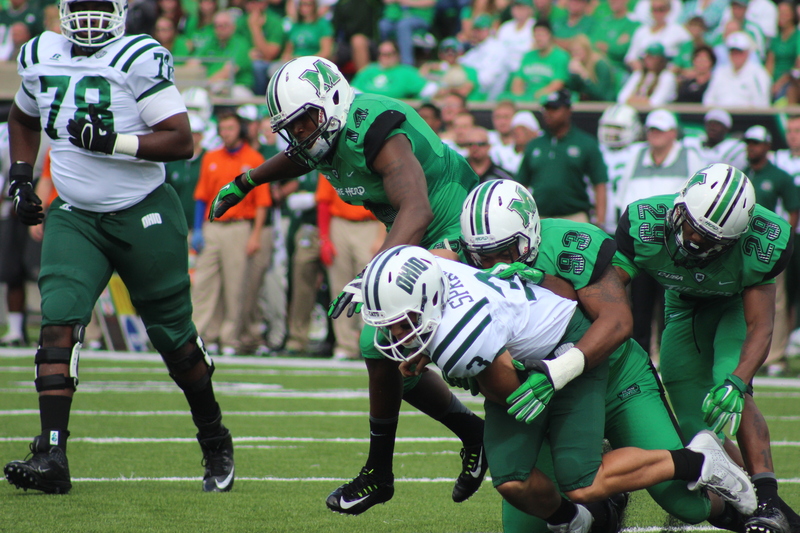 The Thundering Herd could be the Bobcats’ toughest test of 2015. 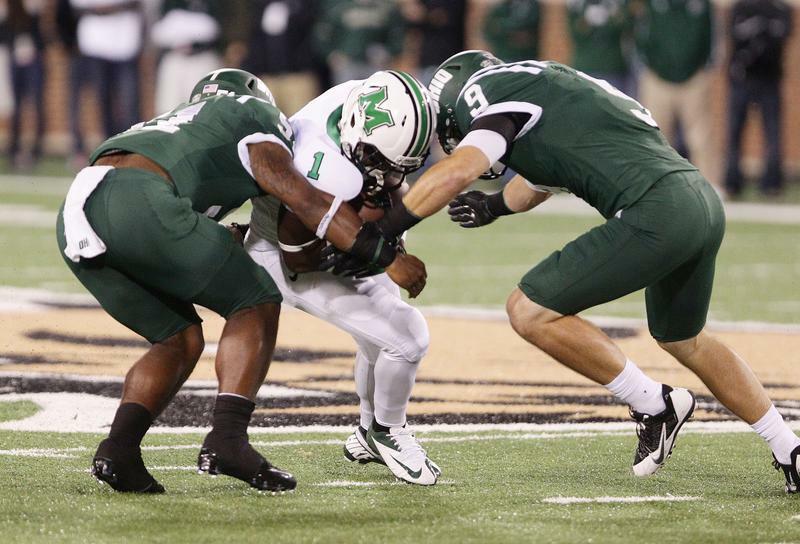 Marshall defeated Purdue 41-31 on Sunday, giving them only five days to prepare for their trip to Athens. Thundering Herd coach Doc Holliday noted that the short week gave Ohio an advantage. Marshall is quarterbacked by Michael Birdsong, a transfer from James Madison. In his Kelly Green debut, the junior signal caller completed 23 of his 36 passes for 234 yards, two touchdowns and an interception. Birdsong also led the Herd on the ground with 43 rushing yards on 10 carries. Despite the blowout defeat last season, the Green & White isn’t exactly eyeing revenge. Following Saturday’s game, these rivals won’t square off until 2019, when the series resumes in Huntington. Given the circumstances, the Bobcats don’t need any more motivation to keep the Bell in Athens for the next four years. Offense: TE Keith Heitzman – The Michigan transfer impressed in his Ohio debut with four catches for 25 yards and a touchdown. His big frame can pose matchup problems for opposing defensive backs. Heitzman was targeted by Vick three times on the Bobcats first two drives last week. If his success continues, Bobcat fans will forget all about Troy Mangen’s injury. Defense: LB Quentin Poling – Poling earned himself MAC Male Scholar Athlete of the Week with his 12 tackle, one sack and one forced fumble performance at Idaho. His ballhawking skills seem to have improved since last season and he’s highly likely to lead Ohio in tackles this year. Poling had three interceptions in last season’s home opener. He’s unlikely to repeat that feat on Saturday night, but the sophomore will have to do more pass coverage than usual against the Herd. Offense: WR Davonte Allen – Birdsong’s top target hauled in five passes for 59 yards in Marshall’s win over Purdue, but that’s a bad week by Allen’s standards. In limited action last season, Allen averaged 90.6 receiving yards per game, including a standout 137 yard, two touchdown performance against the Bobcats. Defense: DB Tiquan Lang – The junior safety had arguably the best game of anyone in football last week. Lang picked off two passes – one on the first play of scrimmage, one late in the 4th quarter to seal the win – and returned them both for touchdowns. The man scored as many, if not more, points as 10 FBS teams in Week 1. And as if that wasn’t enough, Lang also finished the game with 17 tackles. You won’t have to search hard to find #21 on Saturday. Marshall 35, Ohio 27 – Both offenses will come to play in this one, but the ‘Cats secondary will be tested much more this week than at Idaho. The game should be close into the second half, but I see the Herd scoring a late TD to seal it, keeping the Bell in Huntington ’til at least 2019.